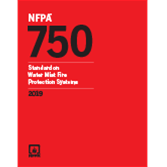 Apply the 2019 edition of NFPA 750 to keep water mist fire protection systems up-to-code and ready for action. Stay informed about the design, manufacture, installation, and acceptance testing of water mist fire protection systems using NFPA 750, Standard on Water Mist Fire Protection Systems. This standard describes design, installation, maintenance, and testing requirements for water mist fire protection systems and clarifies applications that benefit from these systems. Research and technology for water mist fire protection systems are continually evolving, and so is NFPA 750. Interested in other editions of the NFPA 750? Use the drop down menu above to select the edition year you need. 5.1 Classification of Occupancies for Water Mist Systems. 5.2 Classification of Specific Applications for Water Mist Systems. 6.2 Gas and Water Containers. 6.10 Detection, Actuation, Alarm, and Control Systems. 8.5 Gas and Water Storage Containers. 8.6 Pumps and Pump Controllers. 8.8 Valves and Pressure Gauges. 10.2 Light and Ordinary Hazard Occupancy Hazard Fire Control Approach. 10.3 Occupancy Protection Systems for Residential Applications. 11.2 Darcy–Weisbach Calculation Method for Intermediate and High Pressure, Single Fluid, Single Liquid Phase Systems. 11.3 Hazen–Williams Calculation Method (Low Pressure Systems). 11.4 Calculation Procedures for Propellant Gas or Atomizing Media. 12.6 Atomizing Media for Twin-Fluid Systems. 13.4 Detection, Actuation, and Control Systems Documentation. 14.1 Approval of Water Mist Systems. 16.3 Flammable Liquids — Total Area Protection. 16.5 Requirements for Water Mist Systems on Combatant Vessels. Help keep water mist fire protection systems up-to-code with the 2015 edition of NFPA 750. Stay up-to-code informed about the design, manufacture, installation, and acceptance testing of water mist fire protection systems using the 2015 NFPA 750, Standard on Water Mist Fire Protection Systems. This Standard defines the difference between water mist systems and sprinkler systems, as well as clarifies the purpose and various types of applications that benefit from water mist systems. Research and technology for water mist fire protection systems are continually growing. New Chapter 5: Classification of Occupancies and new Chapter 10: Occupancy Protection Systems address the dynamics of occupancy classification in designing a water mist system. These new chapters are essential for confident system design. In another significant change, the ITM sections for water mist systems (other than those installed in one-and two-family dwellings) were removed and now reference the 2014 edition of NFPA 25, Standard for the Inspection, Testing, and Maintenance of Water-Based Fire Protection Systems. NFPA 750 details general requirements, along with provisions for all types of water mist systems, components, and hardware.